The PB model is ideal for large areas. It also adapts to varying soil types and conditions. Professional farmers can work quicker, better and save some labour cost. robust turnover mechanism for optimal angle. This ensures a safe reversing and minimal headlands. 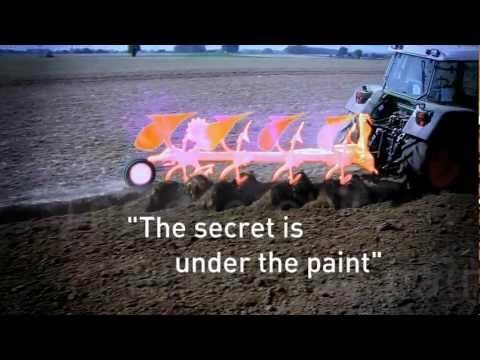 unrivalled Kverneland Auto-reset system for non stop ploughing for PB. No maintenance. With today's demands for higher output, both tractor and plough are expected to perform quicker than ever. This makes more arduous demands on the equipment, particularly on the safety systems designed to protect tractors, ploughs and drivers against the dangers encountered whenever the plough meets hidden obstructions in the ground. The Kverneland Auto-Reset system guaranties this safety high standards requirements. Depending of the type of soil all Kverneland ploughs can be equipped with different leaf springs packages. For soft soils, a normal spring with 5 leaves is the best choice to obtain the perfect ploughing in stony conditions. Today, most Kverneland ploughs are delivered with the Heavy-Duty springs package (HD) with 7 leaves. This will perform well in most conditions. If the soil is very hard and stony - a double leaf spring package is recommended. Kverneland's Auto-Reset System is a quite simple construction that withstands the punishing forces year in, year out, with a minimum of maintenance. Save time and money!